A couple weeks ago, we had a customer come to us with a rather steep liquidation request: Would EthoSource be willing and able to remove 56 Ethospace workstations, 26 3-lateral files and 65 office chairs in a mere 15 hour time frame.… So what was our response? Bring it on. 1 Crew, 1 Night, 150 Pieces of Furniture in this SC Office Liquidation, so it is safe to say that last weekend was an eventful one for the EthoSource Liquidation Team. This fast and fun office furniture removal sent our liquidators down to Greenville, South Carolina to one of the company’s multiple locations. 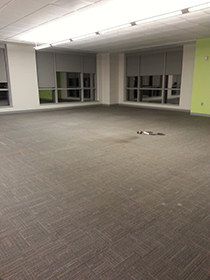 With extreme time restraints and a full floor of furniture to move out, the company needed a team of experts who could get the job done and leave their office space clean and ready to go for their employees’ return the next day. This meant a non-stop effort straight through the night. It wouldn’t be a project just anyone could handle, but luckily, they came to the right place. Starting at 5pm on Friday evening, the company requested that everything be moved out by the time their employees started work 8am Saturday morning. So EthoSource, along with the dedicated professionals of ProMove, were on-site and were active in all the labor from start to finish. One of the biggest keys to making sure the project went as timely as possible was the fact that both trucks from M&S trailers were at the site right at 5pm to be ready whenever they were needed. Our crew of 11 men were well-rested and motivated from the minute they arrived, which helped everything run smoothly and efficiently. By 11pm, the entire 56 workstations were completely knocked down and dismantled, and by 4am, everything was removed through 1 freight elevator, loaded by ramp and ready to roll out. 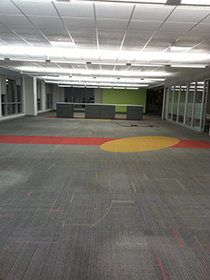 With 4 hours to spare, the space was swept, vacuumed and fully prepared for the employees to come in later that morning. Below is a visual time line of the project from start to finish. 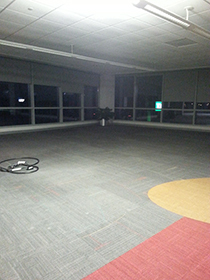 It was a long night, but with the dedication and hard work of the crew, the customer was able to complete their office transition without any inconvenience. Not only were they happy with the job performed, but they requested our help with phase 2: another 70 station move out next month! Woolah! 11 hours later… the site is fully cleared and cleaned. Employees returned to the building the following day without any disruption to their workday! For more information on our Liquidation Services, check out how we can help you!